The University of New Mexico (also referred to as UNM; Spanish: Universidad de Nuevo México) is a public research university in Albuquerque, New Mexico. Founded in 1889, UNM offers bachelor's, master's, doctoral, and professional degree programs in multiple fields. Its Albuquerque campus encompasses over 600 acres (2.4 km²), and there are branch campuses in Gallup, Los Alamos, Rio Rancho, Taos, and Los Lunas.Coordinates: 35°05′02″N 106°37′07″W﻿ / ﻿35.08389°N 106.61861°W﻿ / 35.08389; -106.61861 UNM is categorized as an R1 doctoral university (highest research activity) in the Carnegie Classification of Institutions of Higher Education. Under David Ross Boyd, the university's fifth president, the campus was enlarged from 20 to 300 acres (1.2 km2) and a 200,000-acre (810 km2) federal land grant was made to the university. In 1922, the university was accredited by the North Central Association of Colleges and Schools. During this time, more facilities were constructed for the university, but it was under the tenure of James F. Zimmerman, the university's seventh president, that the university underwent its first major expansion. Under Zimmerman, many new buildings were constructed, student enrollment increased, new departments were added, and greater support was generated for scientific research. Among the new buildings constructed were Zimmerman Library, Scholes Hall, the first student union building (now the anthropology complex), the university's first gymnasium and its first stadium. John Gaw Meem, an architect based in Santa Fe, was contracted to design many of the buildings constructed during this period, and is credited with imbuing the campus with its distinctive Pueblo Revival style. In 1945, the university hired John Philip Wernette to be its eighth president. Upon arrival, Wernette focused on improving the university's faculty, programs, and services. He instituted an eighteen-point program of procedures for the selection of new faculty and appointed a committee to ensure better teaching candidates for faculty members. He also developed a program for faculty advancement. Offices of the General Placement Bureau, Veterans Assistance, and Testing and Counseling Services were formed to assist students and Wernette required all seniors in 1946 to take the Graduate Record Examinations test to provide the school with a measurement of how well it was educating its students. The university started the Law School and the School of Business Administration during his tenure. In 1947 Wernette came into conflict with the Board of Regents over the hiring of two faculty members who he thought were unqualified. His contract was not renewed by the Board of Regents in 1948. During the early 1970s, two sit-in protests at the university led to a response from law enforcement officers. On May 5, 1970, a protest over the Vietnam War and the Kent State massacre occupied the Student Union Building. The National Guard was ordered to sweep the building and arrest those inside; eleven students and journalists were bayonetted when those outside did not hear the order to disperse given inside. On May 10, 1972, a peaceful sit-in protest near Kirtland Air Force Base led to the arrest of thirty-five people and was pushed back to UNM, leading to eight more arrests. The following day, tear gas was used against hundreds of demonstrators on campus and the situation continued to deteriorate, leading to the university to declare a state of emergency. In 2017, the campus became smoke and tobacco free, with the exception of a few designated smoking areas located near the residence halls. The New Mexico Department of Health assisted in the effort, paying for signs and stickers around campus as well as a PSA shown during orientation. The main campus is located on 600 acres (2.4 km2) in Albuquerque on the heights a mile east of Downtown Albuquerque, and is split in three parts – central, north, and south. The central campus is situated between Central Avenue on the south, Girard Boulevard on the east, Lomas Boulevard on the north, and University Boulevard on the west, and is home to the main academic university. The North Campus, which includes the medical and law schools as well as the University of New Mexico Hospital, is located on the north side of Lomas across from the central campus. The South campus is located a mile south of the central campus, centered around the intersection of University Boulevard and Avenida César Chavez, and includes most of UNM's athletic facilities. The central campus is noted for its unique Pueblo Revival architectural style, with many of the buildings designed by former university architect John Gaw Meem, who is credited with imbuing the campus with its distinctive Southwestern feel. The central campus is also home to the University of New Mexico Arboretum, which contains some 320 species of woody plants. Eight university buildings are listed separately on the National Register of Historic Places, including Hodgin Hall, the university's first building, and two adjacent structures, the Art Annex and Sara Reynolds Hall. The Estufa, one of the first Pueblo Revival style structures in the country and the first on campus, is also on the list. Other structures on the registry are Carlisle Gymnasium, Jonson Gallery, Scholes Hall, and the University House. The central campus is home to four museums: the Maxwell Museum of Anthropology in the anthropology building, the Geology and Meteorite Museums in Northrop Hall, the Southwest Biology Museum in the CERIA building, and the University Art Museum in the Center for the Arts. In an effort to promote sustainability and lessen the environmental impact of the campus, UNM has been reducing the campus energy usage through monitoring and retrofitting cooling, heating, water, and lighting technologies. Due to these efforts, the University of New Mexico's grade on the College Sustainability Report Card 2009 improved from a "C" to a "B" according to the Sustainable Endowments Institute. Since 2008, following an executive order that all new state buildings over 15,000 sq ft (1,400 m2) need to meet LEED silver at minimum, all new construction on campus has been registered for LEED status. So far, an expansion of Castetter Hall and the Technology and Education Center are the only LEED-certified buildings on campus, with a Gold and Platinum rating respectively. Several other buildings are currently registered for LEED status. The Academic Ranking of World Universities ranked UNM at 201–300 out of world universities and 72-98 out of U.S. universities in 2016, while The Center for World University Rankings (CWUR) ranked UNM 181st on its world university rankings list and 78th in the United States in 2015, which is up from 185th and 82nd respectively in 2014. High Impact Universities Research Performance Index (RPI) ranked UNM 112th in 2011 in their Top 500 Universities worldwide. U.S. News & World Report (USN&WR) ranked UNM at tied for 180th in the country in their 2016 ranking of "Best Colleges". USN&WR in 2016 also ranked the University of New Mexico School of Medicine tied for 35th in primary care and tied for 83rd in research, with the Rural Medicine residency program as 2nd best in the country and the Family Medicine residency program 10th. The University of New Mexico School of Law is ranked by USN&WR in 2016 as tied for 71st in the country, with the Clinical Law program ranked 10th nationwide, while The School of Engineering was ranked tied for 85th. Also, according to USN&WR 2016 rankings, the school has the 5th best graduate program in photography and 17th best graduate program in printmaking. Other programs ranked in the top 50 nationwide by USN&WR in 2016 include occupational therapy (36), pharmacy (48), and earth sciences (49). The University of New Mexico Model United Nations, known as World Affairs Delegation or WAD, team is one of the top ranked teams in the country, with multiple awards at several different competitions, most notably, the Harvard World Model United Competition in Geneva, Switzerland and Puebla, Mexico. Most recently, the team won the Diplomacy Award and The Resolution Fellowship, both in Panama City, Panama. They have also competed and won awards at the St. Mary's University Model Organization of American States Conference. Admission to UNM is rated as "selective" by U.S. News & World Report. For Fall 2014, UNM received 12,574 freshmen applications; 5,706 were admitted (45.4%). The average GPA of the enrolled freshmen was 3.40, while the middle 50% range of SAT scores were 480-620 for critical reading and 485-620 for math. The middle 50% range of the ACT Composite score was 20-25. UNM's NCAA Division I program (FBS for football) offers 16 varsity sports. The teams are known as the Lobos, who compete in the Mountain West Conference. Two human mascots, referred to as Louie Lobo and Lucy Lobo, rouse crowds at New Mexico athletic events. The official school colors are cherry and silver. The Lobos have won national championships in skiing and cross country running. UNM maintains strong athletic rivalries with New Mexico State University. The UNM-NMSU rivalry is called the Rio Grande Rivalry, a competitive series based on points awarded to the winners of head to head competitions between the two universities in every sport. A rotating trophy is granted to the winning university for a period of one year, until the award presentation the following year. The rivalry is celebrated at UNM by the Red Rally, a large bonfire that takes place the Thursday before the UNM-NMSU football game. The Lobo men's basketball team is famous for its venue, The Pit. It may be best known as the site of the 1983 NCAA basketball championship, in which North Carolina State University, coached by Jim Valvano, upset the University of Houston. The UNM women's cross-country team won the NCAA championship in 2015 and 2017. Lobo Ednah Kurgat also won the individual title in 2017. The Lobo football team plays at Dreamstyle Stadium, which is located across the street from The Pit. The team has been to six bowl games since 1997 after a 35-year bowl drought. Placekicker Katie Hnida made history in the 2003 Las Vegas Bowl when she became the first woman to play in a NCAA Division I-A game, attempting but missing an extra point in the Lobos's 27–13 loss to UCLA. She later attempted and made two extra points in UNM's 72–8 victory over Texas State. New Mexico also lost its 2003 and 2004 bowl games, making its record in bowl games 2–8–1. The football team went to the first year of the New Mexico Bowl in 2006 and lost to San Jose State University 20–12. In 2007 the Lobos finished the regular season 8–4 and were invited to the New Mexico Bowl for the second straight season. The Lobos shut out the favored Nevada Wolf Pack 23-0 to win their first bowl game since the 1961 Aviation Bowl. New Mexico won the National title for Division I Skiing in 2004, defeating then No. 1 ranked University of Denver. In 2017, the team was eliminated and then reinstated. The men's soccer team was National Runner-up in Division I Soccer losing in extra time to the University of Maryland in 2005 as the No. 2 seed, the highest ranking for a UNM soccer team in school history. The main university campus is located in the lower Heights of Albuquerque just east of Downtown Albuquerque, and is the focal point for the neighborhoods surrounding it; the neighborhoods to the immediate south and west are home to a large population of students. However, the vast majority of UNM's student population live off-campus around the Albuquerque metropolitan area, with only just over 2,000 living in on-campus housing. The Student Union Building (SUB) is a major activity center for students on-campus, with a food court, a movie theater, event facilities, student government and organization offices, student services, and recreation areas. Another major hotspot for students is the popular Frontier Restaurant, a late-night eatery located across Central Avenue from main campus and a popular meeting spot for students. The Duck Pond is a popular relaxation spot for students and local residents, particularly in the warmer months. The Associated Students of the University of New Mexico (ASUNM) is the undergraduate student government of UNM, with an elected student body president, vice-president, student court, and 20 senators. Senators are elected to two-semester terms. There are two elections each school year; in each, 10 senators are elected. Many candidates run in slates. There are different agencies within ASUNM, such as Lobo Spirit and Community Experience. The Graduate and Professional Student Association (GPSA) is the graduate student government of UNM, led by an elected President and a representative council from the different schools of study on campus since 1969. The University of New Mexico is home to several fraternities and sororities, around 5% of the UNM student body is involved in Greek life. Of the fraternity's on campus, Pi Kappa Alpha is the oldest fraternity on campus being founded in 1911. Sigma Chi was founded in 1916 being the second oldest fraternity on campus. The Sigma Chi house is the largest fraternity house in the state of New Mexico, as well being located on 1855 Sigma Chi road, the only Sigma Chi chapter in the country, with that address. Both Kappa Sigma and Phi Delta Theta are two of the older fraternity's on campus, as they were founded in 1925 and 1946 respectively. Both Kappa Kappa Gamma and Alpha Chi Omega were founded in 1918, being the two oldest Panhellenic Sororities at The University of New Mexico. Followed behind Chi Omega founded in 1925 and Pi Beta Phi in 1946. The Hanging of the Greens is a celebration held in early December for the holiday season, when the campus is decorated with thousands of farolitos and a procession of carolers winds through the campus to the University House, which is opened for visitors and where cocoa and bizcochitos are served. Homecoming Week is held each fall to welcome back alumni. Over the course of the week, the student body elects a Homecoming King and Queen and six attendants (three male and three female) to serve as the homecoming court. Lobo Day is a celebration for the founding date of the university on February 28, 1889. The tradition in recent years has included a large group photo of students taken in the Student Union Building, which is posted on a wall in the building. Red Rally is a large bonfire and rally held on the Thursday before the football match with UNM's rival New Mexico State University. During Red Rally, a large effigy of an Aggie, the mascot of NMSU, is burned to the ground. UNM Fiestas are an end-of-the year celebration held in the spring which includes a community service event called Spring Storm and a large concert. Welcome Back Days are held during the first week of the school year and welcomes new and returning students to the university, and includes free food, entertainment, and information on the university's programs and organizations. ^ "UNM Factbook 2009–10" (PDF). University of New Mexico. Retrieved June 11, 2010. ^ a b c "The University of New Mexico Fall 2017 Official Enrollment Report Albuquerque Campus" (PDF). Retrieved March 11, 2018. ^ "UNM Color Palette :: UNM Brand Guidelines | The University of New Mexico". Archived from the original on September 24, 2017. Retrieved December 23, 2017. ^ Home. University of New Mexico, Mexico Office. Retrieved on March 17, 2019. ^ "Campuses & Special Programs | The University of New Mexico". Unm.edu. Retrieved March 16, 2011. ^ "Carnegie Classification". Carnegie Foundation for the Advancement of Teaching. ^ a b Davis, William E. (2006). "John Phillip Wernette – Biography". UNM Digital Repository. Retrieved March 12, 2018. ^ "History of UNM Law School". University of New Mexico School of Law. Retrieved March 12, 2018. ^ "J. Philip Wernette Papers: 1915–1987". Bentley Historical Library at the University of Michigan. Retrieved March 12, 2018. ^ "University of New Mexico Presidents – Thomas Lafayette Popejoy" (PDF). University of New Mexico. Retrieved March 12, 2018. ^ "Inventory of the John Philip Wernette Presidential Papers, 1944–1949". Rocky Mountain Online Archive. Retrieved March 12, 2018. ^ Associated Press (May 10, 1970). "Arsonists Strike on 2 Campuses". The Modesto Bee. pp. A–2. Retrieved December 5, 2010. National Guardsmen were withdrawn from the University of New Mexico late Friday after a confrontation with students that sent 11 people to the hospital with bayonet wounds. ^ "CIA Launches Signature School Program at The University of New Mexico". Central Intelligence Agency. November 10, 2016. Retrieved November 21, 2016. The program will deepen cooperation between the Agency and the UNM and result in more opportunities for students and faculty to engage Agency officers and learn about employment opportunities. ^ "UNM to implement tobacco-free campus this Fall". The Daily Lobo. Retrieved August 24, 2017. ^ "UNM Cuts Energy Usage 13.4%, Reduces Utility Spending by $2.4 Million". University of New Mexico. Retrieved June 5, 2009. ^ "College Sustainability Report Card 2009". Sustainable Endowments Institute. Retrieved June 5, 2009. 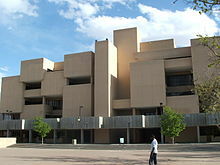 ^ "University Libraries - The University of New Mexico". elibrary.unm.edu. ^ "Academic Programs at The University of New Mexico". The University of New Mexico. Retrieved January 28, 2016. ^ "University of New Mexico- U.S. News Best Grad School Rankings". U.S. News & World Report. Retrieved August 10, 2017. ^ "University of New Mexico - U.S. News Best Global University Rankings". U.S. News & World Report. Retrieved August 10, 2017. ^ "CWUR 2015 - World University Rankings". Center for World University Rankings. Center for World University Rankings. Retrieved February 24, 2016. ^ "High Impact Universities 2010". Archived from the original on July 11, 2011. ^ a b c d "U.S. News Best Colleges Rankings - University of New Mexico". U.S. News & World Report. 2015. Retrieved October 17, 2015. ^ Westervelt, Michael (April 8, 2008). "UNM wins 5 awards at Model U.N. event". New Mexico Daily Lobo. Archived from the original on March 2, 2009. Retrieved July 18, 2018. ^ "Common Data Set 2010-2011" (PDF). University of New Mexico. Archived from the original (PDF) on March 4, 2016. Retrieved October 17, 2015. ^ "Common Data Set 2011-2012" (PDF). University of New Mexico. Archived from the original (PDF) on March 16, 2014. Retrieved October 17, 2015. ^ "Common Data Set 2012-2013" (PDF). University of New Mexico. Archived from the original (PDF) on March 4, 2016. Retrieved October 17, 2015. ^ "Common Data Set 2013-2014" (PDF). University of New Mexico. Archived from the original (PDF) on September 11, 2015. Retrieved October 17, 2015. ^ a b c d "Common Data Set 2014-2015" (PDF). University of New Mexico. Archived from the original (PDF) on September 11, 2015. Retrieved November 1, 2015. ^ "University of New Mexico". U.S. News & World Report. 2016. Retrieved October 17, 2015. ^ "KUNM-FM 89.9 Home". Kunm.org. Retrieved March 16, 2011. ^ University of New Mexico Press. Unmpress.com. Retrieved on February 27, 2013. ^ a b "New Mexico PBS". New Mexico PBS. Retrieved March 2, 2012. ^ "New Mexico Daily Lobo :: The Independent Voice of University of New Mexico since 1895". Dailylobo.com. Retrieved March 16, 2011. Bellmore, Audra, "The University of New Mexico's Zimmerman Library: A New Deal Landmark Articulates the Ideals of the PWA," New Mexico Historical Review 88 (Spring 2013), 123–63. Wikimedia Commons has media related to University of New Mexico. "New Mexico, University of" . New International Encyclopedia. 1905.